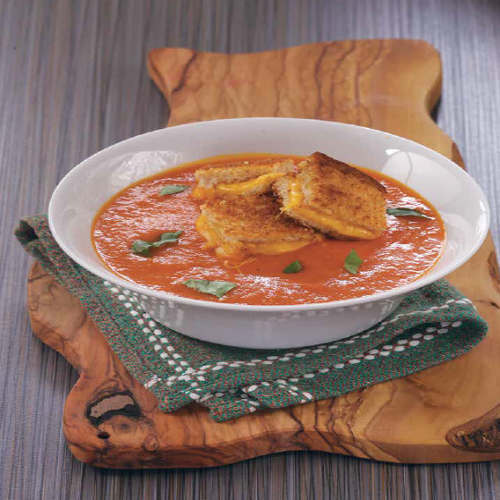 Tomato soup and grilled cheese sandwiches are a classic combination. In this recipe, I bring the pair even closer by serving tomato soup with grilled cheese croutons! It’s interesting, unique and, most importantly, delicious. Be sure to use fresh plum tomatoes to make this soup—they are tastier than canned tomatoes. 1. In a non-stick saucepan lightly sprayed with cooking spray, heat the oil over medium heat. Add the onions and garlic and cook for 3 minutes, until the onions are softened. Stir in the tomatoes, stock, tomato paste, sugar, salt and pepper. Bring to a boil. Cover, reduce the heat to low and simmer for 15 minutes. 2. Working in batches, purée soup in a blender or food processor until smooth (hold the lid down with a towel to prevent hot liquid from leaking). 3. Ladle the soup into serving bowls and garnish with the basil. Top each bowl with 2 grilled cheese croutons. Serve immediately. 1. While soup is cooking, sprinkle 1 slice of bread evenly with the cheese. Sandwich with the remaining slice of bread. 2. Heat a skillet over medium-high heat. Lightly spray both sides of bread with vegetable oil and cook in hot skillet for 2 minutes per side, just until the cheese melts and the bread is lightly browned. 3. Cut the sandwich into 8 squares. Serve.